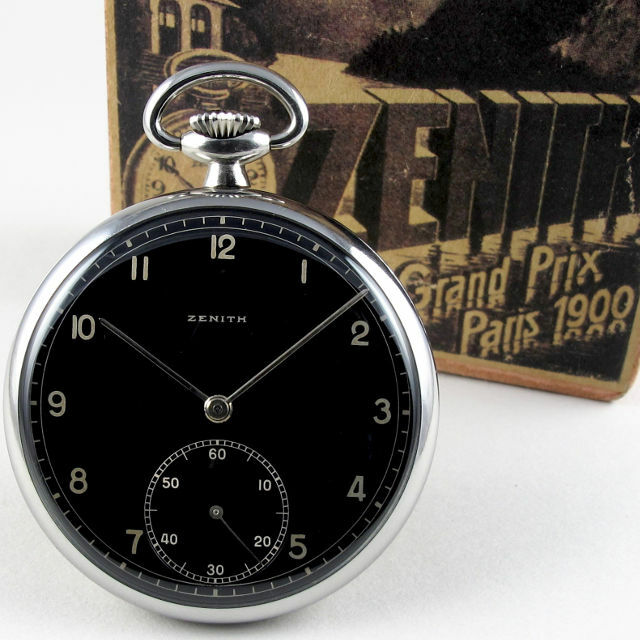 Opening this week’s newsletter is a superb Zenith pocket watch with a wonderful black gloss dial. Dating to c. 1935-1940, the watch is in outstanding original condition and is accompanied by a card Zenith presentation case with fabulous graphics – monochrome to the outside and with bright coloured Zenith signature and winged personification of Time to the inside of the lid. The silvered Arabic numerals, minute and subsidiary seconds calibrations contrast brilliantly with the rich black tone of the surface and match perfectly to the steel of the case. A really great looking pocket watch from the golden era of vintage watch production, this is a stunning watch to hold in the hand. 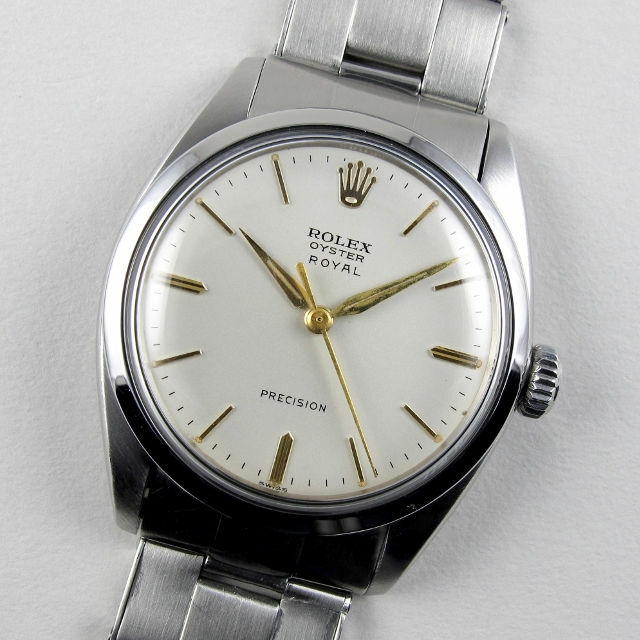 Next is a Rolex Oyster Royal wristwatch made in stainless steel. The watch is fitted with its original, detachable, satin finished, stainless steel riveted link bracelet which has polished finished caps to the sides. The adjustable folding clasp is, like the watch’s case back, date stamped for the year 1962. The silvered dial is in great condition with a silk matt finished surface, raised gilded baton indexes and Alpha-shaped hands. Manually wound, the watch is powered by the calibre 1210. A handsome example of a late 1950s Tudor Oysterdate, this watch is date stamped to the inside case back for the year 1959. The silvered dial has a circular satin finish with applied, faceted spear-shaped indexes at the quarters and slim baton indexes at the intervening hours. Cased in stainless steel, the Rolex Oyster case has a screw-down crown and case back. An automatic model, this watch is powered by the calibre 2462 which has provision for semi-quick date change – whilst the date will change each day at midnight, it can be manually advanced, when required, by moving the hands repeatedly between 9pm and midnight. 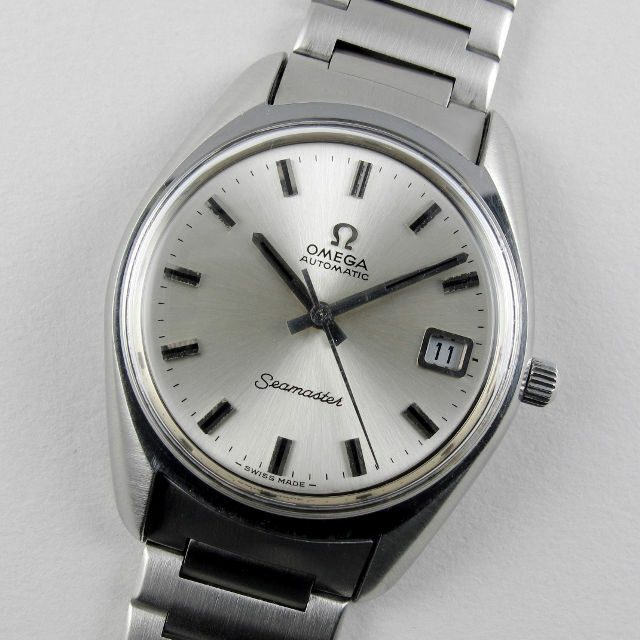 This is a relatively large vintage Seamaster model with a stylish, tonneau-shaped design. The stainless steel case has a bold and solid upper body with an integrated polished bezel, whilst the substantial rounded sides and lugs have a brushed, satin finish. Powered by the automatic Omega calibre 1012, the movement has a multi-functioning crown allowing quick date change and incorporating a hack feature for time setting. This watch is fitted with its original, satin finished, flat link Omega model 1206 bracelet with adjustable folding clasp. 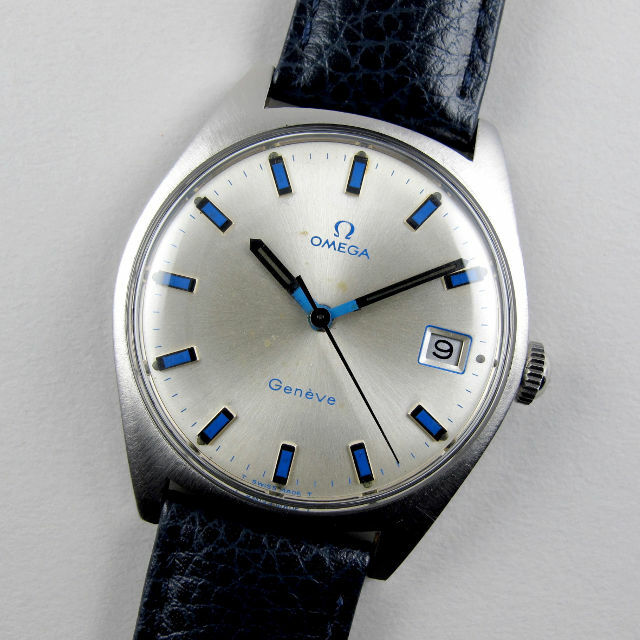 Omega first launched this Genève model 136.041 in 1967 and the present example, which dates to the end of that decade, has an unusual, blue accented dial. The dial has a silvered, satin finish and the raised baton indexes are detailed with black surfaces that are centred with blue rectangles. The hands are styled to match with black lengths and blue bases, whilst the dial text, tracking and frame to the date aperture are all finished in a complimentary blue ink. Manually wound, the calibre 613 Omega movement has provision for quick date change. 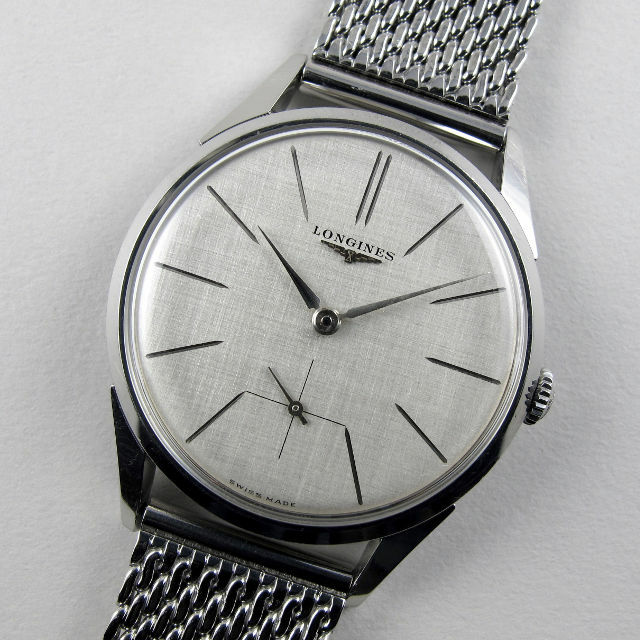 This Longines wristwatch has an unusual and distinctive dial with a ‘linen textured’ finish. There are incised silvered baton indexes which have a polished finish, catching the light as it travels across the dial’s surface. Beneath the dial’s signature, the Longines winged hour glass logo has engraved detailing and is applied to the surface. The stainless steel case, which has the original Longines winding crown, is relatively large for the period of production with a diameter of 35mm and there are long, slim lugs that are gently down-turned. A traditional vintage watch design, this cushion-shaped wristwatch has a very handsome two-tone dial with raised Arabic numerals and an engine-turned subsidiary seconds dial. 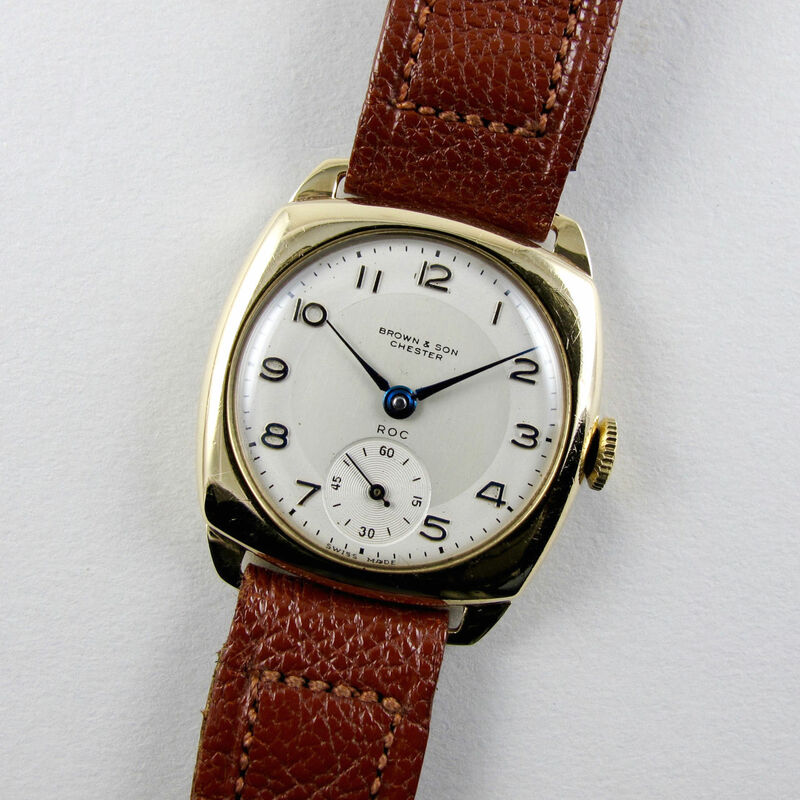 Kathleen Pritchard notes in the second volume of her work, Swiss Timepiece Makers 1775-1975, that ROC was a sub brand which the Swiss watchmaker Zenith’s UK arm, Zenith Watch Co. (Great Britain) Ltd., imported into the UK during the 1950s and 1960s. The inside case back of this watch is stamped with Zenith’s maker’s mark ‘”ZW Co.” just beneath the serial number to the inside case back. The watch was retailed by Brown & Son of Chester, a dealer of jewellery, watches, gold and silver. To the outside of the case back is a presentation inscription from the clothiers and outfitters, Bradleys of Chester. 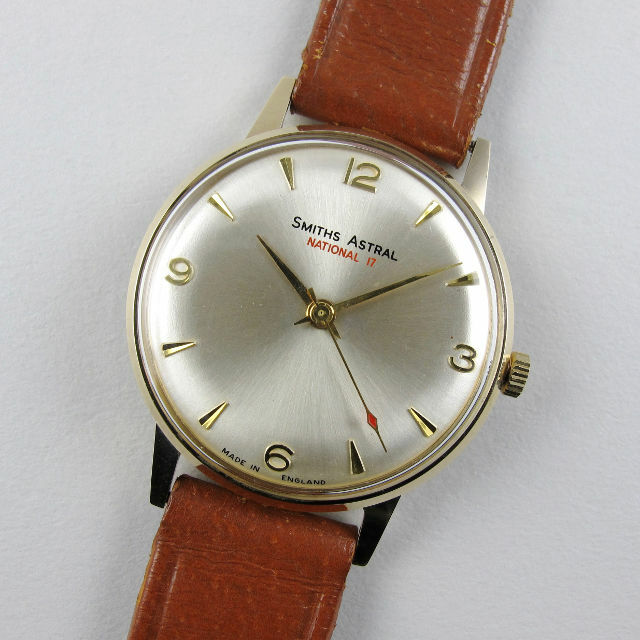 The watch is fitted with a vintage, fully stitched, leather strap which has been lightly used. This is an especially good example of the Astral National 17. The 9ct yellow gold case retains good definition to its angles and edges and the silvered dial has a bright satin finish that is handsomely configured with raised, gilded, Arabic and triangular numerals. The ‘National 17’ text is toned to match the red lozenge detailing of the centre seconds hand. Made in England, this watch incorporates Smith’s Cheltenham manufactured calibre 60464E. Just added to the website is a colossus of a book (it weighs some 10kg) which is dedicated to Cartier’s collection of their own timepieces. 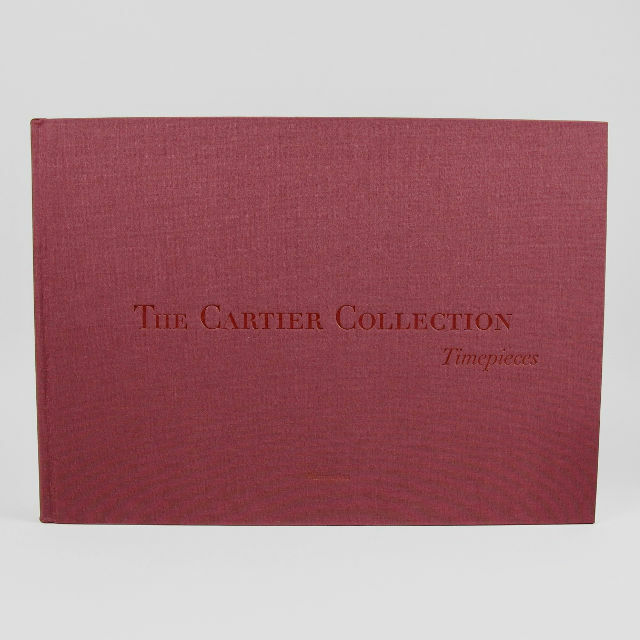 The book details, in stunning photography, the history of Cartier timepieces from 1853-1997. Cartier began to buy back and form their historical collection of timepieces in 1973 and has since amassed an extraordinary array of beautiful watches, clocks and other timepieces. The book is divided into historical periods with timepieces illustrated and arranged according to their style, forms and materials. 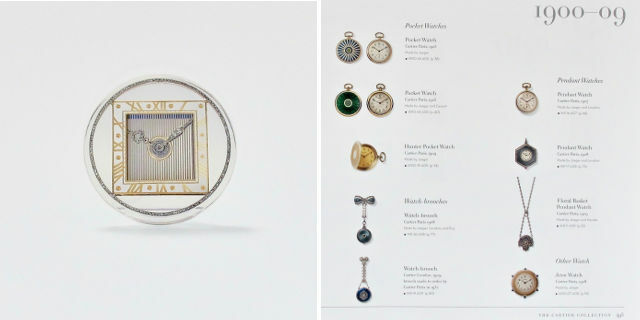 The 424 timepieces (124 clocks and 300 watches) are illustrated life size – to fit the larger clocks into the book, there are several fold out pages. At the back of the book there is an excellent chronological summary of all timepiece in date order with, where relevant, their model names.